The ADF's commitment to Afghanistan is known as Operation HIGHROAD and is fulfilled by personnel serving with the ADF's Task Group Afghanistan. Task Group Afghanistan's Headquarters is at Kabul's Hamid Karzai International Airport and comprises a command element of about 45 ADF personnel, which coordinates administration, communications and logistics support for all ADF members deployed to Afghanistan. Australia remains committed to a stable and secure Afghanistan and continues to support the NATO-led train, advise and assist mission called RESOLUTE SUPPORT which has replaced the previous NATO-led International Security Assistance Force (ISAF) mission. Around 250 ADF members from the Royal Australian Navy, the Australian Army, the Royal Australian Air Force and Defence civilians are deployed in Afghanistan as part of Operation HIGHROAD. 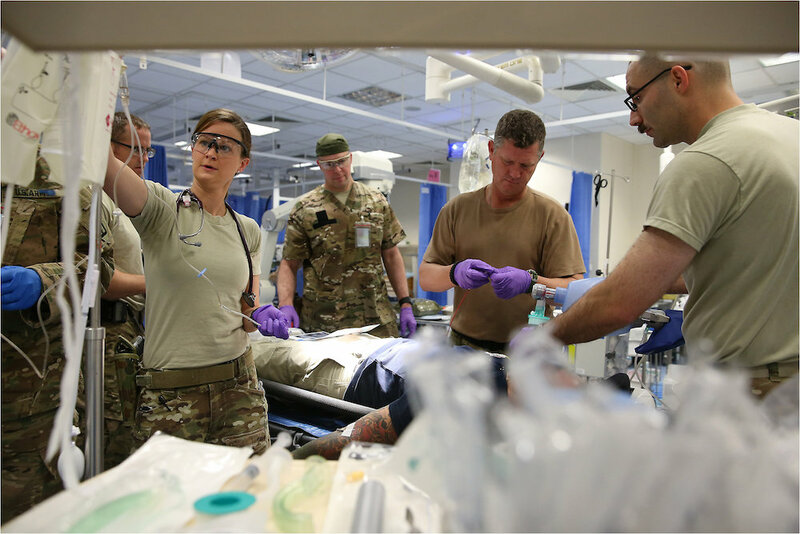 Royal Australian Navy nursing officer Lieutenant Megan Hoare works with other Australian and US medical personnel to treat a role-playing casualty during an exercise at Nato’s Role 2 hospital at Kabul Airport.